From Queens, N.Y. to Crested Butte, the daily grind for Eileen Hughes would seem a torrent of high adventure for the average, work-a-day bloke. This long-time local recently landed in the midst of a new challenge, the long-vacant position of general manager for KBUT Community Radio. Hughes went to high school in Queens and earned her bachelor’s degree at the State University of New York (SUNY) at Binghamton. “I studied anthropology,” she laughs. After graduation, she headed west. And north. “It was during the hippy, back-to-the-earth movement. I thought all I needed was land,” she recalls. The couple spent eight years commercial fishing for salmon and halibut, and even shrimp for a couple of winters. Jack still returns to Alaska each summer to fish. Local Crested Buttians and Alaskans know him as Captain Jack. “I really liked fishing, but after a few years, husband and wife, well, let’s just say there can only be one skipper at a time. Jack likes to say it was like, ‘It’s time to either get your own boat, or…’ I don’t have the guts to be in charge of my own boat, and I got seasick. “There was no radio in Homer then, period. I lived a mile off the road, no electricity, no running water. We melted snow for water in winter,” she continues. A fellow fisherman, Kevin Hogan, started the process to get a radio station started. “I helped him do a community needs survey,” says Eileen. That was her first exposure to public broadcasting. Sometime later, Eileen and Jack were piloting a boat north from Seattle, where she’d ducked into a bookstore and bought a treatise on broadcast media. “I decided I wanted to be a news reporter,” she says. “KBBI was a well-funded operation,” says Hughes. There was a two-person daily news team, a call-in talk show and Alaska News Nightly. “One reporter I worked with became a producer for Prairie Home Companion.” Corey Flintoff and Peter Kenyon were once KBBI reporters too, both now foreign correspondents for National Public Radio. “Alaska at that time was known as a great training ground for that caliber of talent,” notes Eileen. Hughes worked as KBBI’s news director for nearly nine years. “I hate to say this, but when I started doing news here, I found it quite boring.” Natural resources in Alaska are a dominant topic, as are commercial fishing, hunting, tourism, oil—and the community and human-interest stories, always colorful. 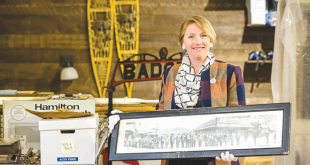 Soon, Hughes became the program director, a position she held for three years before moving on to a job with the town of Crested Butte, first part-time, then full-time as the town clerk, a position she held for 10 years. 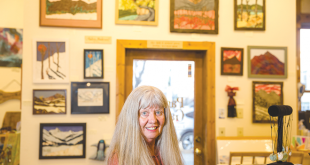 Eileen enjoys all that Crested Butte has to offer, including biking, hiking, rafting and every mode of skiing—backcountry, XC touring, skate skiing, and telemarking on the mountain. Radio is still a passion, too, a talent well-forged, making her an ideal choice to nudge KBUT back on-course. “I think there’s a place for radio here, and always will be,” Eileen says. 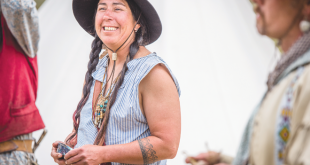 “There are still plenty of people who rely on KBUT, who think of it as their friend in the same way as those isolated in remote Alaska.” Hughes herself has no TV, a radio loyalist to the core. You can hear her on-air every Thursday night at 6:30, host of the Dirt Farmer’s Revenge. The station turned 26 years young this fall. KBUT’s winter pledge drive is set to begin Monday morning, February 11.